During and before the four years Hillary Clinton was secretary of state, the Clinton Foundation run by her husband took tens of millions of dollars from foreign governments and corporations. Many of these donors had a lot riding on Clinton’s decisions. 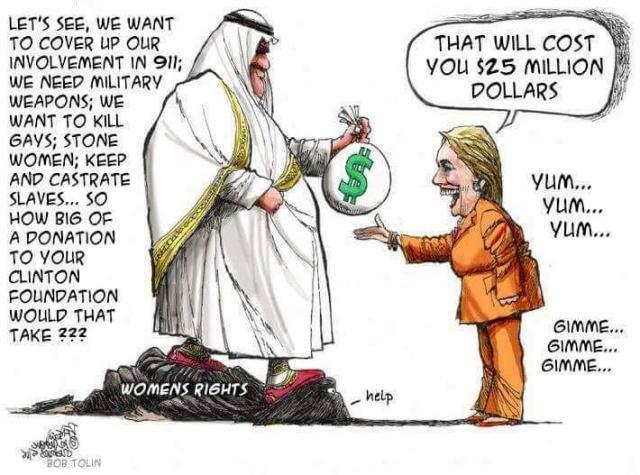 Saudi Arabia gave the foundation up to $25 million, and Clinton signed off on a controversial $29 billion sale of fighter jets to the country. Oil companies gave the foundation around $3 million, and Clinton approved a lucrative gas pipeline in the Canadian tar sands they’d long sought. We've known the basics of this story for months now. But another media feeding frenzy over the foundation kicked off again on Monday, when the State Department was forced to release emails showing that the foundation’s leadership tried to land its top donors meetings with the secretary of state. Clinton’s defenders say the new disclosures don't amount to much. Certainly, none of them offers proof that Clinton was willing to trade government favors directly for big contributions. Moreover, as Mother Jones’s Kevin Drum writes, most of the donors’ requests to see Clinton were actually turned down. Many of the donors she did meet with — people like the crown prince of Bahrain and Nobel Peace Prize Winner Muhammad Yunus — were more or less exactly the kind of people you would think would be able to get a meeting with a Cabinet secretary. So if there was no quid pro quo, does that mean Clinton's conduct was aboveboard? I interviewed four experts this week — and their answer was that the Clinton really did risk dramatically escalating an already serious problem with money’s influence in politics. The key to understanding why good government advocates are upset about the new revelations is to first get past the argument that Clinton Foundation donors were transactionally rewarded for their gifts. This is not what my sources argued. Instead, the heart of their complaint was that the foundation’s contributors appear to have gained a greater ability to make their voices heard by Clinton’s State Department by virtue of donating to her husband’s private foundation. This is why they see the new email disclosures as such a big deal. Talking with top government officials obviously isn’t the same as getting them to do your bidding, but doing so can help structure how they think, whom they turn to for advice, and, ultimately, what they decide to do. And the emails at least strongly suggest that foundation donors had a better opportunity to mold the secretary of state’s worldview than they would have otherwise. Having the State Department opening its doors to foundation donors suggests that the people who are giving to this foundation will get consideration from the Clintons in the context of their work — in her case, the US diplomatic process and possibly more. This risks creating an environment through which you think through problems, make decisions, and seek information when you’re trying to analyze complex situations. It takes a big effort to get beyond that. Clinton might think, "These people are interesting, and they’re doing great work, and they’re helpful to me and my husband." That’s just human nature. But the basic, core problem here is that you’re creating a geography for your thinking that’s definitionally narrow — and based partly on who has money. They had the opportunity to present their case to the State Department in ways other people don’t. How do we know foundation donors really did get better access to Clinton’s State Department? Well, it’s impossible to prove — no Clinton staffer was stupid enough to write, "Thanks for giving $10 million to Bill! Now we can get coffee!" Note: This is the editorial from the September/October 2018 edition of The American Conservative magazine. This summer the media hive was buzzing around a hot courthouse in Alexandria, Virginia, as former Trump campaign chairman Paul Manafort stood trial on charges of fraud and tax evasion relating to his lobbying activities for Ukrainian political interests in the 2000s. In the course of the highly publicized trial, prosecutors, with the help of Manafort’s fair-weather ex-partner Rick Gates, argued that the longtime Washington operative played fast and loose with the money he earned for his foreign consulting services, including parkingit in unreported accounts in Cyprus and buying Ukranian assets through a shell company in the Cayman Islands. And we’re talking a lot of money—$17 million over two years alone to flak for then-Ukrainian president Viktor Yanukovych, who got thrown out of office anyway in 2014. Beyond that, Manafort spent a decade raking in millions not only from Yanukovych and his party, but associated spin-off clients, including a 2006 contract with a Russian businessman worth $10 million annually to help boost Vladimir Putin’s rep in Washington. But to the salivating chattering class, the exploits of the dapper but much-depleted (he’s been behind bars and since convicted) Manafort are mere set pieces in a more sweeping narrative they hope will be confirmed at the end of this Robert Mueller-directed summer blockbuster: that Manafort played a starring role in the heretofore unproven Russia-Trump collusion scandal of 2016. But while the Russia-bedazzled press is focused on Manafort’s schemes, the rest of us toiling away in the Beltway know all too well that he’s just the algae bloom floating atop a much larger ecosystem, one in which foreign influence peddling is a multimillion dollar industry involving high-profile Republican and Democratic firms and countries with much worse human rights records than Russia. Interestingly, news reports in late July only fleetingly covered Mueller’s probe of three other Americans working with Manafort on behalf of Ukrainian interests, including Democratic lobbyist Tony Podesta (brother of Clintonista John Podesta), former Obama White House counsel Greg Craig, and former Republican representative Vin Weber. That a revolving door of elected officials and bureaucrats would sell their skills and influence to the highest foreign bidder is anathema to most Americans. And we’re not just talking the Manaforts of the world, but a wide swath of familiar names, like John Boehner, Trent Lott, Richard Gephardt, Bob Livingston, and Tom Daschle. According to Ben Freeman of the Foreign Influence Transparency Initiative at the Center for International Policy, foreign entities spent over $400 million here in 2016—$1 out of every $8 spent on all lobbying, foreign and domestic, that year. (This is only what was registered under the Foreign Agents Registration Act, but as we know with the case of Manafort, who was consulting “off the books” for years, there’s a lot more going on in these murky waters than we think.) According to Freeman, most lobbying is for maintaining foreigners’ stake in our Military-Industrial Complex, like keeping troops and bases overseas, and sustaining the flow of billions in aid and weapons. Not surprisingly the top spenders are Japan and Korea, with Saudi Arabia, UAE, Qatar, and China not far behind. Sometimes it’s tied in with image polishing (Manafort earned his keep in the 1980s with dictators like Mobutu Sese Seko and Ferdinand Marcos as clients). In the last year the Saudi Kingdom has dumped millions on the Beltway to gin up good press for “reformer” Crown Prince Mohammed bin Salman. More quietly, in 2017 the Saudis employed American firms to help kill JASTA (the Justice Against State Terrorism Act) which was pursued by 9/11 families because it would allow them to take the Kingdom to court for its alleged ties to the hijackers. Saudi money even paid (in some cases unwitting) U.S. veterans to lobby for their interests on Capitol Hill. Recently, The Christian Science Monitor reported that out of the $11 million Saudi Arabia spent in 2015, most was to undermine the Iran nuclear deal. Resources were lavishly spent on top lobbyists like former GOP senator Norm Coleman. Trump withdrew from the deal this year, bringing the two countries ever closer to armed conflict. Sure, something smells in Alexandria, but the stink is wafting from over the Potomac. Unfortunately, this is a lesson no one seems to learn when they come to town to “clean things up”: you’ll never get rid of the Manaforts if you can’t see the swamp for the Tupelo trees. “Mr. Huber with the Department of Justice and FBI has been having an investigation — at least part of his task was to look at the Clinton Foundation and what may or may not have happened as it relates to improper activity with that charitable foundation, so we’ve set a hearing date for December the 5th,” he told Hill.TV previously. That hearing was postponed until Thursday because of President George H.W. Bush's funeral service. Meadows had wanted to quiz Huber on whether any of the Clinton Foundation’s tax-exempt money was used for personal gain, as well as a litany of other conservative allegations against Clinton, such as the State Department’s approval of a uranium deal with Russia. The Oversight Committee, as with all other House panels, transfers to Democratic control next month because of the results of the midterm elections. “Consistent with conversations between the department and the committee, Mr. Huber will not appear at the hearing,” she said.